In short, Wilma's outfit is defined by the pin-up girl fashion trending at the time The Flintstones animated series was aired. It looks like something taken out of the 50's with a few minor tweaks to make it look prehistoric, like the rough edges of her dress for example. A white one-shoulder dress and a pearl necklace. That's about it for Wilma in TV series and movies. 1 White, one-shoulder dress It doesn't get more straightforward than this. All you need for the main part of this costume is a white, one-shoulder tube dress. Something you should keep in mind though, is to make sure that the one strap of your dress falls on the left shoulder, just like Wilma's. Another point worth noting is the length and hemming of the dress. Anywhere above your knees is fine, but it's got have that zig-zag around the edges to make it look distressed and raggedy. 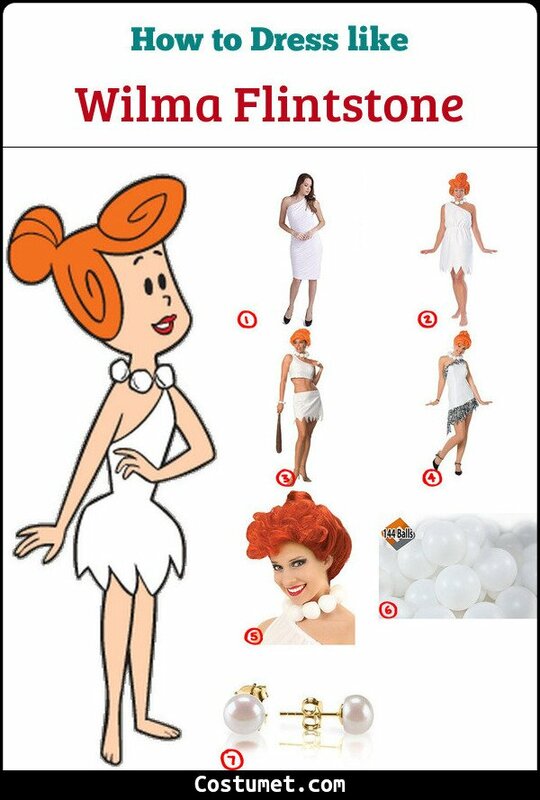 2 Full Wilma costume Plan B: just get the whole suit. For instance, this set includes not only the dress but also the necklace and a wig. 5 Wilma wig If you already have mid-long red hair, good news! You're already half-way through, otherwise, don't sweat it; this wig has your name on it. It's even styled after Wilma's hairstyle in the 1994 movie The Flintstones. Regarding Wilma's hairstyle, of course there's a cartoonish alternative taken straight out of the animated series that is also popular among cosplayers. Youtuber and make-up artist Nikole Jackson has video tutorial on how to make a proper pin-up girl approach to your Wilma Flintstones hair and make up. Wilma Flintstone is one of the main characters of The Flintstones animated series and movies. She tends to be the voice of reason of her husband Fred whenever he is out on one of his schemes. She also helps him and Barney out of trouble when plans don't work out. Wilma and Betty used to work at a resort selling cigarettes. That's how they met both of their husbands who also worked at the same resort. Wilma was originally voiced by Jean Vander Pyl in the 60's animated series. Then she was portrayed by Elizabeth Perkins in the 1994 live-action adaption. In both versions Wilma Wilma is best friends with Betty Rubble and mother of Pebbles Flintstones. Over the years there's been a debate on whether Wilma's last name is Slaghoople or Pebbles and although there's been many a great theories about such discrepancies, the actual reason was revealed to be a mistake in continuity during the production of the show. In short, her maiden name should be Wilma Pebbles, but it was later changed to Wilma Slaghoople. At the end of the day, she'll always be the Wilma Flintstone. Betty Rubble hardly ever wears anything else than her blue tube dress and her blue hair bow. If it's the cartoon version you're aiming for, a tube dress will do. For the movie version you may be looking at a double-layer dress. Do not miss the bow though. To dress nice and comfortably like Pebbles, you'll need a wide-strap tank top. It could be orange or green, but it must definitely have curby, black triangles all over. You'll also want to get some shorts. You get to pick the color for the shorts between black and aquamarine. Eliza is the typical nerdy-looking girl. Braided pigtails, over-sized round glasses, braces, long blue socks and brown Oxford shoes. What really stands out from her whole apparel is the yellow, t-shirt dress with red pockets and turtleneck.